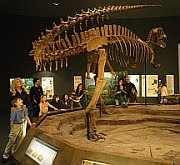 Admission to the Delaware Museum of Natural History will be waived from 9:30 a.m. - 12 p.m. on Sunday, Feb. 7, 2010 courtesy of the PNC Foundation. This PNC Free Sunday Morning is part of a grant from the PNC Foundation's Grow Up Great with Science initiative. Grow Up Great with Science provides local preschool children with opportunities to learn science basics and experience related activities that are educational and fun. The Delaware Museum of Natural History is using the funding to train local preschool teachers and introduce families of preschool children to science through visits to the museum's interactive exhibits. Museum experts will also travel to classrooms to help teachers create children's activities that enable them to explore science with their senses and use simple tools to test their ideas. Many of the activities receive assistance from PNC employees as volunteers. This PNC Free Sunday Morning on second of three at the Delaware Museum of Natural History during the 2009-2010 school year. The last PNC Free Sunday Morning will be on May 23, 2010. What: PNC Free Sunday Morning with free admission from 9:30 a.m. - 12 p.m.
More information: Visit www.delmnh.org or call (302) 658-9111.